Cognitive Radio is an enabling agile technology for communication and channels sharing in multimedia and wireless networks. The authors consider multimedia traffic transmission over Cognitive Radio (CR) networks using a progressive source coding associated to fountain codes. For a Cognitive Radio infrastructure where the spectrum is owned by Primary Users (PUs) that have Binomial and/or Poissonian traffics, Secondary Users (SUs) are allowed to share these spectral resources using the Opportunistic Spectrum Sharing feature of the Cognitive Radio concept. 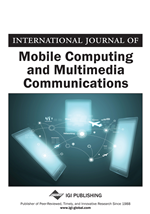 The objective of this paper lies in characterizing the reliability and as a result evaluating the performance of the secondary multimedia service provision under both primary traffic types in lossy Cognitive Radio environments. The authors have conducted a general analysis for many still open issues in Cognitive Radio and tackle three critical factors responsible for secondary service disruption: primary traffic interruptions, concurrent access to shared frequency bands leading to collisions and subchannels characteristics. Numerical simulations, in view of the average Spectral Efficiency, examine the performance of the multimedia transmission under the primary interruptions caused by the Binomial and the Poissonian primary applications and consider also the dynamics between the competing secondary peers in addition to subchannels fading and noise. With the rise of a wide range of technologies and services and the increasing need for more quality of service (QoS) and bandwidth, two contradictory findings regarding the radio frequencies behavior have been reported. Despite of the spectrum exhaustion problem caused by the increasing demand for the frequency spectrum making the radio spectrum a scarce resource today (Federal Communications Commission, 2010), actual observations and real spectrum measurements taken on some frequency bands reveal the low and discontinuous usage of the licensed spectrum in time and space (Shared Spectrum Company, 2009; NTIA, 2003). That is, legacy frequency allocation process has proven to be inefficient and requires a profound reconsideration and rethinking, there is a real need for optimizing the use of spectral resources. To this end, the Cognitive Radio (CR) (Mitola, 2000) has been introduced as a well regarded approach to find strategies for enhancing and sustaining the growth of multimedia and wireless networks with limited spectrum. In the Cognitive Radio context, every telecommunication system will be divided into two collocated networks: a primary network called Primary Users (PUs), which owns the spectrum license, and a secondary network referred to as Secondary Users (SUs), which is allowed to use the primary network’s bandwidth in case of PU absence. In order to enable the coexistence of both primary and secondary traffics within the same architecture, international regulatory agencies aim at exploiting some notions like the Negotiated Spectrum Sharing (NSS) and the Opportunistic Spectrum Sharing (OSS) (FCC, 2003) for CR networks. In the NSS approach, secondary users are allowed to use the underutilized portions of frequency bands for a negotiated cost and following a predetermined schedule subject to an explicit agreement with the license holders. This policy needs a radical change in spectrum regulation in terms of when spectrum bands and at which location are enabled for secondary use. The OSS (Cabric, Mishra, Willkomm, Broderson, & Wolisz, 2005) is a key component in Cognitive Radio networks and an optimal way to exploit the spectrum holes that has been temporarily vacant by license owners. In fact, periodically, secondary users conduct a local sensing measurement campaigns. The collected measurements are exchanged between different SUs and communicated to a third trusted host, called centralized scheduler (Chaoub, Ibn Elhaj, & El Abbadi, 2011c), to make a global decision about the potential spectrum holes. Unfortunately, there is a penalty for either false alarm or miss detection due to failure in detecting the presence or not of the primary signal. In this sense, the “hidden node” problem is one of the recurring phenomena in spectrum monitoring issues and is still in open field of research (Kamil & Khider, 2008). The use of a cooperative sensing system should enable drawing a complete picture of the surrounding primary and secondary users and as a result alleviate the occurrence of this problem. Authors in Ben Letaief and Wei (2009) have given an excellent summary of recent advances in cooperative spectrum sensing. The hidden node issue is beyond the scope of this paper. From the sensing-inferred decisions, the third party assigns to each secondary user a Secondary User Link (SUL) formed using a composition of multiple subchannels (SCs) judged as being vacant and temporarily accessible by SUs. Afterwards, each SU starts its transmission through its allocated SUL. The set of chosen subchannels should be scattered over multiple PU frequency bands in order to be able to battle on two crucial challenges: (1) to cap the interferences caused by the primary traffic reclaims below a predefined design specification, and (2) to reduce the number of jammed subchannels once the primary user appears during the lifetime of a SUL. This principle of dispersing the selected subchannels over the frequency domain is referred to as the Spectrum Pooling Concept (Weiss & Jondral, 2004).